Shirley L. Rogers was born November 4, 1933 to Vernon P. and Mabel (Woten) Sudduth in Lyons, Nebraska. She passed away March 8, 2019 at Oakland Heights in Oakland, Nebraska. Shirley started school at District 46 east of Oakland. After moving back to the Lyons area, she attended school in Lyons. She graduated from Lyons High School in 1952. She married Don Redding in 1952 and lived in Lyons, Blair and Sioux City before moving back to the Lyons area. Following a divorce, Shirley married Randy Rogers in 1975. They have lived in Lyons ever since. Shirley worked at Save more Market in Lyons for many years. She always enjoyed talking with everyone she helped. Failing eyesight forced early retirement, and she spent the remainder of her life at home, but always enjoyed getting out and meeting people. Her greatest joy was time spent with her family, either in person or by phone. She was preceded in death by her parents; brother-in-law, Bill Kubovich; son-in-law, John C. Kroger. 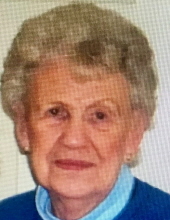 She is survived by her husband, Randy; children, Kandi (Edward) Modlin of Scotland, SD, Kim Kroger of Elkhorn, NE, Kelly (Debby) Redding of Oakland, Kirk (Scott Barrett) Redding of Omaha; sister, Jan Kubovich of Grimes, IA; eight grandchildren; fifteen great grandchildren; nieces and nephews; many friends. No Visitation. Burial at a Later Date. "Email Address" would like to share the life celebration of Shirley L. Rogers. Click on the "link" to go to share a favorite memory or leave a condolence message for the family.